Handmade jersey bottoms in a bright colours and black print and a matching, black vest appliqued with a plane. 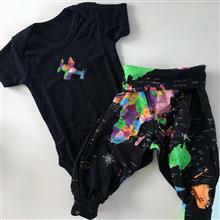 These sets are easy to get on your baby and are made from soft cotton jersey. They come wrapped up with a ribbon bow, making them a gorgeous gift. These sets are handmade (with the exception of the body suit) and are only available in the sizes listed.